Brentford manager Uwe Rosler paid tribute to his side after they came within seven minutes of knocking out FA Cup holders Chelsea on Sunday. But Fernando Torres' 83rd-minute strike rescued a replay after a thrilling fourth-round tie at Griffin Park. "I'm so proud of my players and the way they represented themselves, both individually and collectively," Rosler told BBC London 94.9. "I am happy but also realise we had the chance of a lifetime to win the tie." Brentford, who are third in the third tier of English football, were the better side for long spells and twice held the lead through Marcello Trotta's first-half goal and Harry Forrester's penalty 17 minutes from time. The draw now sets up a lucrative replay at Stamford Bridge, but Rosler is aware how close they came to pulling off a major shock. "Overall, I think it will be a great occasion for Brentford Football Club to go to Stamford Bridge," he said. "With six minutes to go I thought we would win the game, but generally everyone should be relaxed and look back and say 'we did a great job'. That positive feeling should stay with us. "We can make life difficult for them, but we need luck. "We were the better side in the first half, but in the second the wind made it very difficult for us to come out of our own half. "We generally defended well, made one or two mistakes, but nothing major and obviously the second goal was a great goal and you can't do much about that." 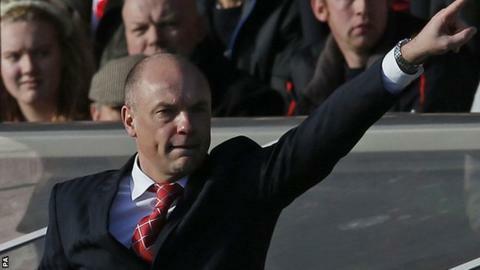 Rosler, who says the league is still their main priority, felt his team were more united than Chelsea on the pitch. "I enjoyed it very much. I enjoyed the whole build up and to see Griffin Park sold out, that is an achievement in itself. "I am happy for the players also that they have shown what they can do and all credit to them."